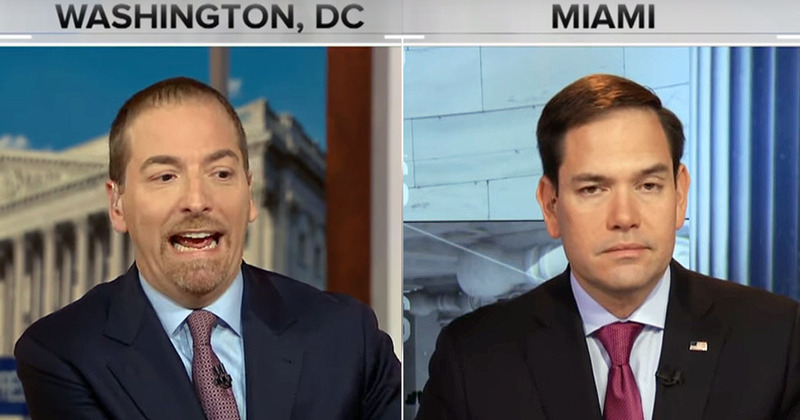 RINO Marco Rubio came into the friendly confines of Chuck Todd’s Meet the Press to deliver some back-handed attacks against President Trump and provide some underhanded leftist ammunition. He says, “48 hours to go before retirement I would have certainly done it differently, given the fact that there’s still this report out there that hasn’t come in.” There are other reports implicating McCabe in criminal wrongdoing, many of them, which Rubio is fully aware of in his position as a member of the Senate Intelligence Committee. Todd takes the position that the DOJ finally holding one of their criminal elites to the same standards as the rank and file and the American people, is a bad thing. Only a corrupt leftist would interpret the Office of Professional Responsibility holding someone professionally responsible as something regretable. Rubio dodges the question saying that he doesn’t like the back and forth. It’s a deliberate creation of the left but Rubio doesn’t bother to mention that fact. A true Republican leader would put some meat on those boney comments and call out the Democrats responsible and support our President under siege. That’s not Marco Rubio. He then takes the easy tack of defending the agents as a whole as a justification for ignoring the corruption at the top. If the field office work force is so filled with individuals of integrity then why are none of them standing up to the corruption within their ranks? There is an obvious absence of character that is being glaringly demonstrated through their silence. If they want to have pride in their organization they should take an active role in cleaning out the corruption. That doesn’t even make sense. He was fired based upon his lying to the FBI and other crimes. Todd knows that but he’s a propagandist, not a news guy. He then reads President Trump’s tweets calling out the witch hunt for what it is, and asks Rubio if there’s anything in there that he finds factually correct. That means Mueller is exceeding his already broad mandate from Rosenstein with the full approval of the establishment traitors. He was authorized to investigate “any links and/or coordination between the Russian government and individuals associated with the campaign of President Donald Trump,” as well as “any matters that arose or may arise directly from the investigation.” They’re slithering across thin ice claiming legitimacy on the “any matters that arose” caveat. If the FBI or CIA wants to investigate Russia, go for it, that’s their jobs. The pretext for this sham investigation has been met without evidence being uncovered. It’s time for the witch hunt to end with no witches having been found. The sham is being exposed, along with its enablers. I could never understand why Trump endorsed Rubio. The entire uni-party is against him and they make no pretense about it. They’re not supporting any of his policies and only cobbled together a watered down tax bill, nowhere near what was outlined during the campaign. Whenever I put my tin foil hat on to try to figure this nonsense out, it seems like they are all in on it. Trump and the swamp play managed opposition. Trump is the MAGA man, the Rs blame the Dems, and hope the outcome is “we need more Rs to get things done”. It’s been over a year and all we’ve done is offer amnesty. 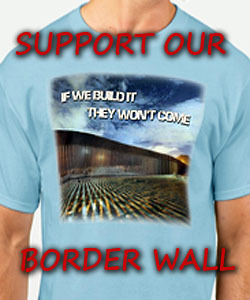 “we’re going to build the wall”. as i’ve said here and other places. if nothing else the election of President Trump has caused ALL THESE RINOS AND COMMUNIST DEMORATS TO EXPOSE THEMSELVES FOR WHO THEY REALLY ARE. SWAMP CREATURES OF THE LOWEST ORDER. and ALL NEED REMOVED FROM POWER AND THEIR OFFICE.